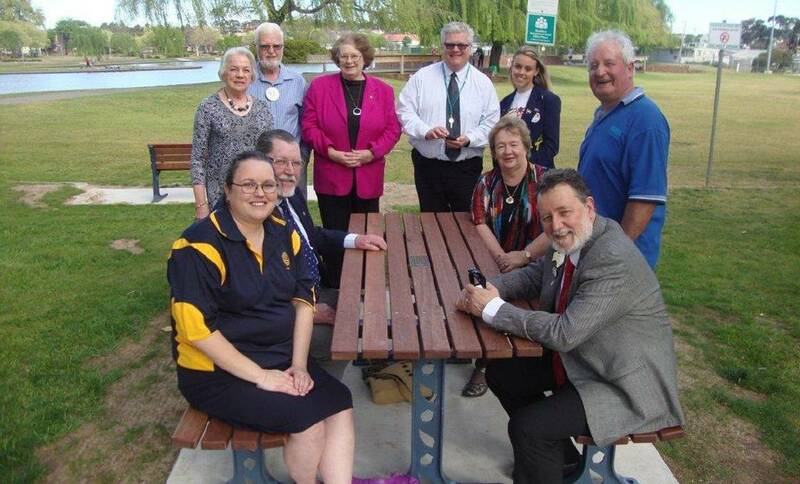 Rotary Club's gift to Stawell | Rotary Stawell Inc.
A picnic table and seat and two benches have been installed on the Victoria Street side of Cato Park. The furniture bears plaques explaining the significance of the gift. Secured to a slab of concrete, the new furniture matches existing furniture in the Park. Current and past Rotarians gathered to attend the handover, which was timed to coincide with the official visit of District Governor Geoff James and his wife Meryl. The Rotary Club wishes to thank the staff of the Northern Grampians Shire Council for their wonderful assistance in implementing this project.